What Is In A Name! Q. Swadhinchand was a big industrialist. After earning a lot of money in foreign countries, he thought of starting some business in India and for that purpose, he opened an office, in Delhi. He wanted to manufacture modern bicycles. Thanking that starting a new factory would take much time; he decided to purchase any of the existing factories, e.g. Jaire Cycle Works Limited, Tejari Cycles and Allied Industries Ltd, or Priya Cycles Ltd. He surveyed 414 houses. There were 515 bicycles. 28 houses had no bicycles at all. In 46, 55 and 62 houses there were bicycles manufactured by Jaire, Tejari, and Priya industries respectively. 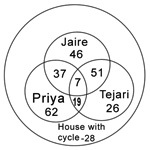 In 51 houses the bicycles were from Jaire and Tejari, in 19 houses from Tejari and Priya, and in 36 houses from Priya and Jaire. In 7 houses there were bicycles from all 3 companies. Findings: The popularity of Jaire bicycles was undoubtful in market. 176 houses were surveyed. They had 200 bicycles. 35 houses did not use cycles. ¼th minus 3 houses had Priya bicycles. 25 had Jaire and 26 hd another Tejari. 10 houses had all the three models. 15 houses had both, Tejari and priya and 6 houses had Jaire also, while remaining 18 houses and both, Jaire and Priya. Findings: Priya was most in demand in the market. After studying both the reports, Swadhinchand decided to purchase the shares of Priya Cycles Ltd., and issued orders to go ahead with that. Simultaneously, he dismissed Chint Raman, the surveyor who was under the impression that having surveyed more houses than his counterpart he would be rewarded. Lakhan Chand was appointed as Chief Manager (sales). Can you guess why Chint Raman was dismissed? A. Chint Raman’s survey was not genuine.